Mission Impractical társasjáték - Magyarország társasjáték keresője! A társasjáték érték! A Mission Impractical egy kiváló társasjáték, 3 - 5 játékos részére, az átlagos játékidő rövid, csak 30 perc. A társast, 12 éves kortól ajánljuk kipróbálni. A játékmenet erősen épít a történetmesélés mechanizmusra. Put the kids to bed? How creative are you, and how creative do the other players think you are? 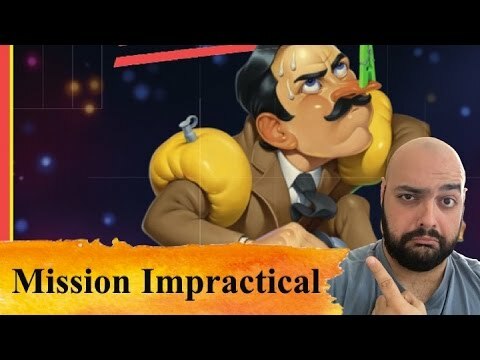 Mission Impractical is the party game about not knowing your limitations and forgetting all about the laws of physics. In more detail, four mission cards are placed on the table. The active player draws a number to see which mission they have to fulfill, then selects four out of sixteen available item cards to give clues as to what that mission is. Each other player tells a story that explains what they think the plan might be, then the active player reveals the real plan. For each player that guesses correctly, both the guesser and the active player receive a point. A player who guesses correctly before the fourth item is chosen receives a bonus — but only one such point is available per round, so be quick!